Hampshire first-team coach Dale Benkenstein believes the county deserve to be promoted to Division One. Victory for Hampshire over Glamorgan will seal promotion, as will matching third-placed Essex's result against Worcestershire, with Paul Grayson's side 10 points adrift in the table. "I really feel like we deserve it," Benkenstein told BBC Radio Solent. "They have put in the effort, are a great bunch of guys and to get promoted would be the icing on the cake." Essex are the form team in the division having won five out of the last six, but face a Worcestershire side that have already secured promotion and only need another six points to seal the title. 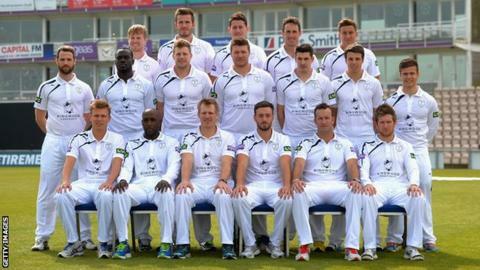 If Hampshire beat Glamorgan in Cardiff they will be promoted. If Hampshire lose, Essex will go up if they beat Worcestershire. If Hampshire draw with maximum bonus points or fewer, then Essex could also finish in second spot with a maximum-bonus-points victory at home to already-promoted Worcestershire. Benkenstein revealed they will have one eye on Essex's game while they take on Glamorgan in Cardiff, but does not feel the match should define their season. "It's a great sign when you go into your last game with everything to play for," he explained. "It would have been nice to have tied everything up a lot sooner but we take a lot of positives from the fighting spirit of the last game. It's a good sign. "It's pretty harsh to say the whole season comes down to one game, we've had a really good season and have made some positive steps in four-day cricket. "I've been pretty happy and from our point of view it would be disappointing if we don't play well - if we do then we will be right in contention in this match. "It's important but we will go about it like any other game. Everyone knows what we are playing for but in a four-day game you cannot get all hyped up. We know we are a good team and one game does not determine that. Obviously there is a lot riding on it and hopefully the result will take care of itself. "My worry is there are lot of outside factors that can determine things and it would be pretty sad if that's the case. If it's because we don't play well then we will hold our hands up. I still think we've played really good cricket, which is something that will continue over the next few years." Hampshire managed to earn a draw against Kent to keep promotion in their hands and Benkenstein believes if they can repeat the consistent cricket that has got them to the verge of going up they will be successful. "Essex have played exceptionally well," he said. "We have not been able to string six or seven wins together but have played consistently good cricket."